Just Play volunteer Litiani Tupou (blue) with children from Fangaleóunga. Huge demand for the OFC Just Play Programme in Fangaleóunga – a village in the Haápai Islands in Tonga – has led to the biweekly Sport for Development programme becoming a daily activity, with sessions running Monday to Saturday every week. Using a beach soccer court to implement sessions, the village has participated in Just Play for over four years, educating the local children about healthy lifestyle choices, gender equality, inclusion, and keeping safe through active football-based activities. 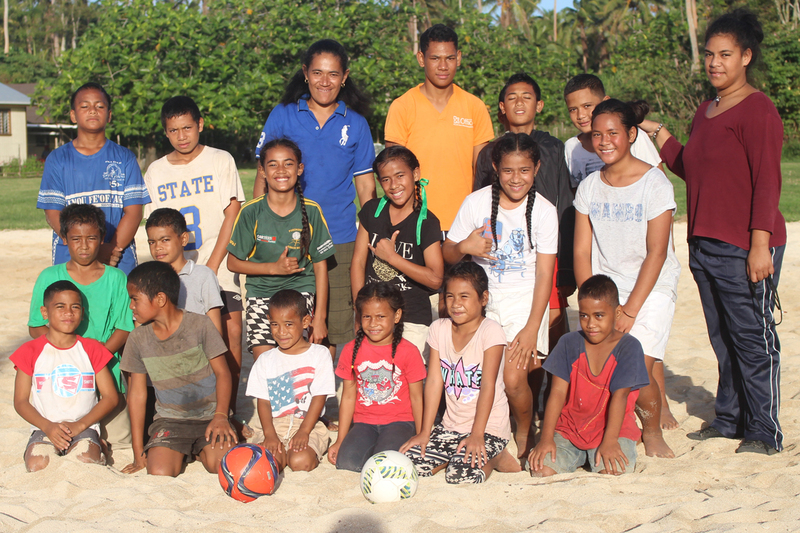 Fangaleóunga village Just Play volunteer Litiani Tupou was more than happy to increase the number of sessions to six days a week after seeing such a positive response to physical exercise from children in the community. “I joined Just Play with my understanding that we must run this programme once or twice a week, but the children wanted me to do it every day,” she said. Although Topou’s schedule has had to change to cater for the increased frequency of the programme, she has been grateful to have the full support of her husband, who has become an advocate for the programme after witnessing the positive impact it has on children first-hand. “I am forever grateful for my husband as he allowed me to run the programme anytime,” she said. “He noticed the big impact on our children, as they practised avoiding junk food and stopped buying frizzy drinks from the shops. Although the content of the programme has proven effective, Topou credits the success of the programme to the motivated and committed team leading sessions and delivering the programme in the village. “I wish to thank the Just Play team for creating such a great programme that encourages our children to eat healthy food, and to love and enjoy exercise in a safe place. The OFC Just Play Programme is a sport for development programme that helps children to grow, learn and explore through sport. Just Play gives a child a ball, a coach and a safe place to play. The programme shows children how to have fun with other children, be physically active and become confident in their abilities. Through the integration of social messages, Just Play helps children to develop healthy lifestyle habits, encourages gender equality and leaders in the community, promotes social inclusion and insists on sport for all.